Mid-City Scrap Iron & Salvage Co.,Inc. has the unique ability to service commercial and industrial partners of any size. Our commitment to communicate effectively with our customers and provide quality, comprehensive services, has allowed Mid-City Scrap to partner with a wide range of businesses and agencies from local professional scrappers to Fortune 500 companies. We understand that every customer has unique requirements. 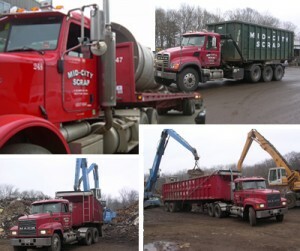 Mid City Scrap has the resources and equipment to provide a wide variety of scrap metal recycling equipment and trucking solutions. We pay competitive prices and maintain a professional and safe environment. Mid City Scrap can station outdoor roll off or indoor metal collection containers at your site and collect them as often as you need until the job is done. Mid-City Scrap has every type of container, tractor, trailer and other machinery needed to accommodate your specific needs. We also offer special pricing programs to customers who have their own equipment and deliver metal themselves to our facility at 548 State Rd. in Westport, MA. Mid City Scrap’s commitment to our customers have also driven us to invest in development and fabrication. When the situation requires it, we will often develop and build custom equipment to ensure we can meet your unique requirements.